2. 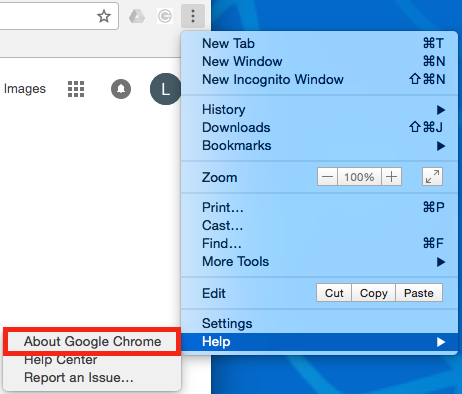 Choose "Help" and then "About google Chrome"
4. Once completed you will either see a button to relaunch Chrome or it will notify you that you are already up to date. Note: If the browser is too out of date, usually it will not automatically update itself and will either say it cannot update or will tell you it is up to date when obviously the version is too low. In this case you will need to manually download the latest version of Chrome. Follow these directions to do so.